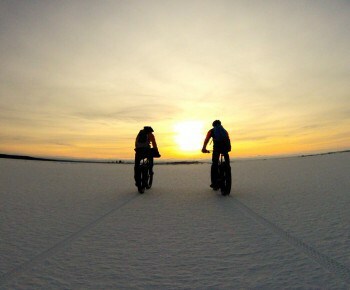 How to make the most of the autumn in Swedish Lapland as a biking nerd. Follow Olov and his friends on a epic downhill biking adventure in Björkliden and Abisko, where the scenery leaves them astounded. It is a grey and overcast Friday afternoon in the beginning of September. Luleå is cold and windy. The autumn winds creep inside the jacket and I feel like going away, a trip to a warm?sunny place is tempting. 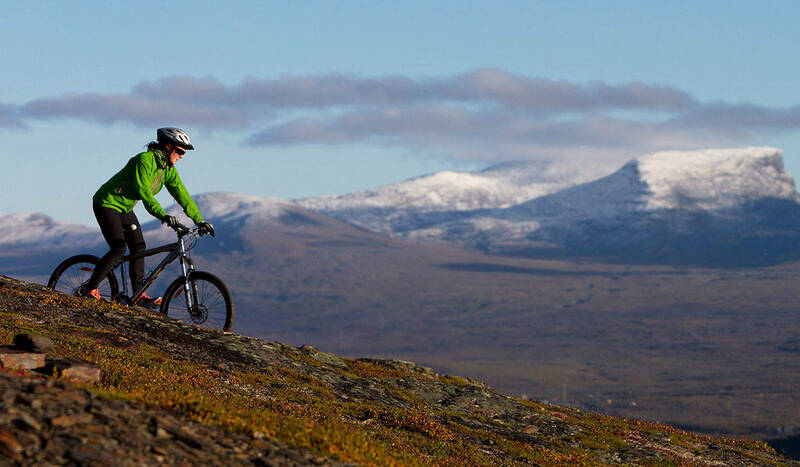 But being a biking nerd I can’t think of a better way to conclude the mountain bike season than an autumn weekend in the unmatched fells of Swedish Lapland. The grey skies and drizzle are soon forgotten as I pack my bike and my bags in a state of euphoria. It is not possible to grow accustomed to the magnificent scenery, not even when you get to see it every day. I pick up three mates on the way: the Broman brothers, well- experienced bikers and also a certain Huring, a beginner warming to bicycling who has tried MTB on two occasions. The fully loaded car is driven northbound floating on our longing for endless?trail biking and wild downhill runs. We stop for the compulsory hamburger meal and a few hours drive later we pull in at the hotel in Björkliden. After unloading and some refreshments we hit the sack. I have been to Björkliden loads of times. As a kid I always used to spend Easter holidays at Hotell Fjället with my parents. In my teen years I used to hang in both Björkliden and Riksgränsen. In short, I have spent quite a lot of time here, mostly in the winter though. And still, when I step into the kitchen in the morning to get the coffee going, I am stunned by the view. It is sensationally beautiful. Later on during the weekend our quartet will grow to a quintet with the arrival of Ulrika from Kiruna. She has spent?a few seasons here and agrees with me: it is not possible to grow accustomed to the magnificent scenery, not even when you get to see it every day. I am thus left paralyzed with the coffee pot for a few minutes — even though the weather is not that spectacular. The mates awake in due course. After some moaning from the Broman brothers on the lines of “apple sauce on the porridge belongs in the nursery”, we can start planning our adventures?for the day. We are forced to revise our plans to some extent. We had planned to bicycle along the trail Rallarleden towards Rombaksbotn, from there take the ferry to Narvik followed by a return drive by bus. This tour is said to be fabulous. However the ferries are not running this late in the season, so instead we decide to explore the old downhill course running from the Kitteldalsliften. The poor sod will come across greater challenges — but of this he is still unaware. The course was built by seasonal workers?and bikers three or four years ago and we find it without problems, it is actually even signposted. We start walking uphill towards Kitteldalen and Svarta Björn. This is a good idea since we can also do some recceing. After quite a walk mixed with some uphill biking we have come to the conclusion that the course is in surprisingly good condition. Right, ?a few berms could have come in handy but in principle everything is intact, probably because it has hardly been used over the past few years. After a chocolate break and a few minor incidents with lost and recovered GPS and goggles, we drop in to the course. This is more of a fast single track than a traditional downhill course. 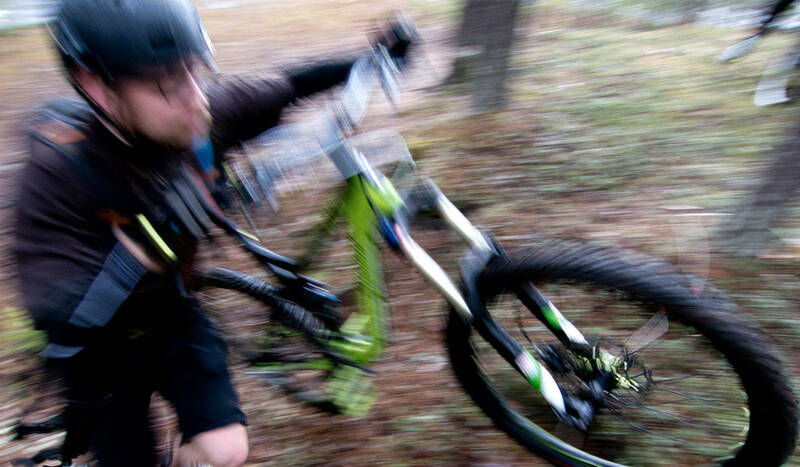 We set a high pace and I catch myself laughing out loud as we careen along the trail between the mountain birch trees, this is easy fun downhill biking. Huring, the rookie of the group who is riding one of Björkliden’s more basic rental bikes makes it down without any roblems. The poor sod will come across greater challenges — but of this he is still unaware. Adrenalin-pumped and childishly happy we pedal up to the hotel for a bit of lunch. The lasagne at Restaurant Lapporten hits the right spots. While we are munching we actually spot a few flurries of snow, luckily enough only a few brief ones. The sun comes out and we decide to go to Låktatjåkko Mountain Lodge in the afternoon. One good thing about Björkliden is that the hotel and cabin village are in quite high situation. We only have to ascend a few hundred metres past Rakkasliften and the first tee on the golf course before reaching the bare mountain; remarkable to be this close to paradise. Once over the first ridge we are met by a web of trails, making the choice almost tricky. We pick the northern trail to Låktatjåkka Fjällstation, a rather demanding climb over about nine kilometres. Along the trail we meet several hikers. We stop to chat with a few of them and are told there are several decimetres of snow halfway up. We make it up to the snow where we are forced to turn back. Poor Huring is probably a bit shocked at the realisation how much you have to lead and carry a bike uphill. 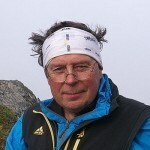 I am dreaming about next day’s trip, Rallarvägen to Abisko, lift up on Mount Njullá and then the ride down to Björkliden. The reward is however awaiting us: a brilliant four-kilometre single track quickly obliterates all the hardship we suffered on the way up. If we had made it all the way to the lodge this would have been the highlight of the trip — including the famous waffles. As?we pedal into the hotel parking area we have covered 1 048 vertical metres and the cold beer in the lobby at Hotell Fjället a couple of hours later is well deserved. Following a rich Boeuf Bourguignon à la Huring and a visit to the sauna we have no problems going to sleep. I am dreaming about next day’s trip, Rallarvägen to Abisko, lift up on Mount Njullá and then the ride down to Björkliden. 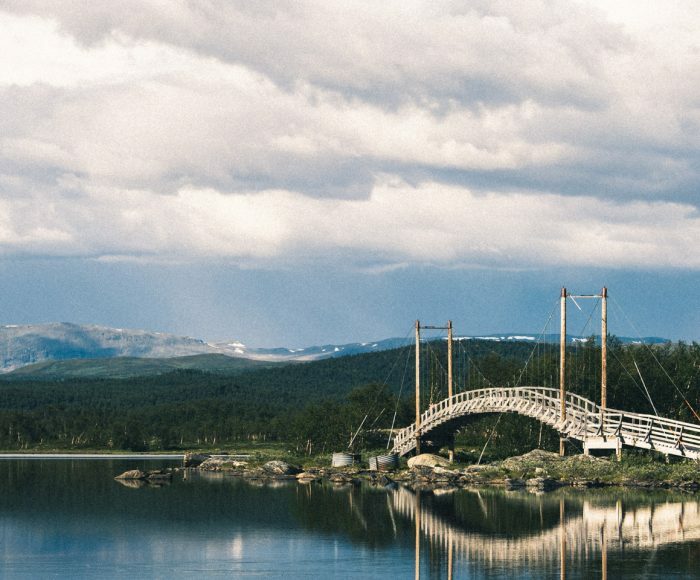 Spectacular views awaits in the Swedish Lapland mountain world. Spectacular views awaits in the Swedish Lapland mountain world. Downhill, or rather uphill biking. Downhill, or rather uphill biking. The following morning Lapporten welcomes us with brilliant sunshine. The morning procedure repeats itself: I am again standing with the coffee pot in my hand, staring at the magnificent views from our cabin. The Broman brothers’ whining is not repeated after we bought lingonberry jam in the shop by the railway station. Rallarleden towards Abisko is an eight kilometre trail leading around Mount Njullá, which we intend to ride downhill later on. 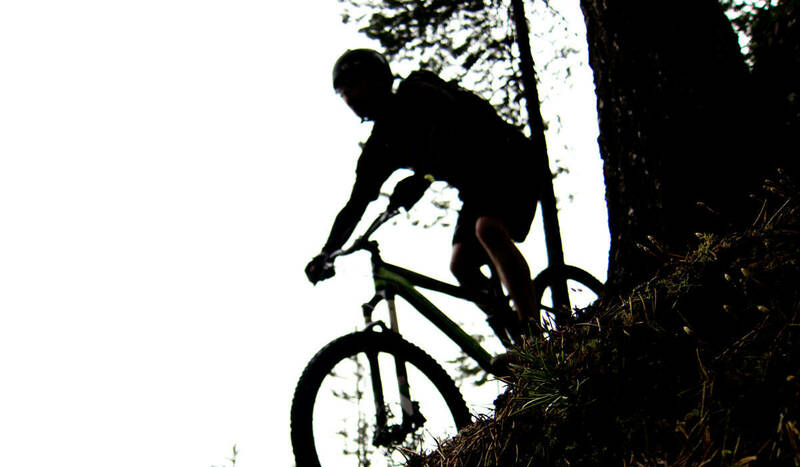 This is a meandering and scenic trail, easy to pedal and ideal for novices as well as more experienced riders. It snakes its way between the mountain and Lake Torneträsk. In contrast to the bare mountain this part is green and lush. A few kilometres before Abisko we pedal below the E10 road, almost on the shores of the lake. We are approaching Abisko and come right up to the fabulous ’jokk’ which cuts through the rock before running into Lake Torneträsk. We stop on a ledge and remain there completely entranced. 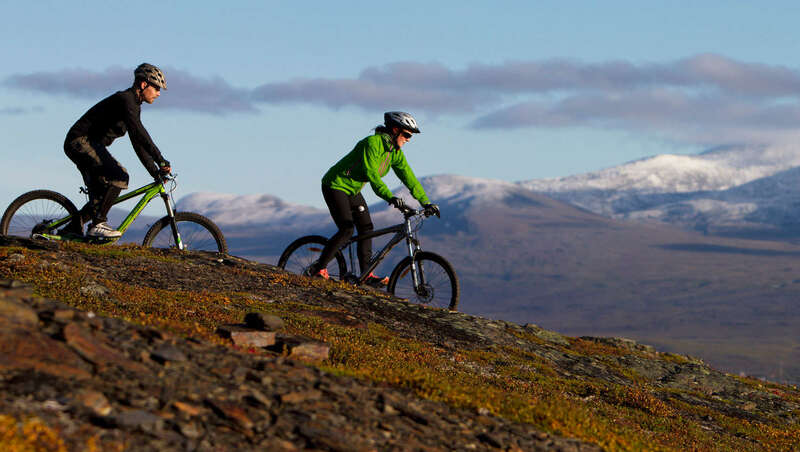 When we arrive at Abisko Turiststation we see ads showing their biking activities. You can buy a lift pass and do the downhill course laid out on the slopes. That would have been nice but we only need a single ride. Our plan is to make it to the summit and then ride down the back of the mountain to Björkliden. Regrettably we have to revise our plans again. It turns out that you cannot bike down the back of the mountain as long as you use the lift uphill. If you want to use the lift you can only ride the downhill course. The reason for this is bureaucracy, I did the back of Mount Njullá a couple of years ago, one of the coolest things I have done on a mountain bike. You cannot get any closer to off-piste skiing in the summer. But this time we are forced to ride the downhill course which in itself is not such a pity. The only problem is that it is quite advanced. Our lightish AM bikes are not built for this type of course and to tell the truth, we might be lacking some technique as well. Poor Huring riding a rental bike, who finally gets to ride the lift uphill, ironically has to carry the bike downhill most of the time. After alternatively carrying and biking down we roll back to Björkliden along the Rallarleden. In the afternoon we join up with Ulrika. The sun is shining and we decide to do an evening tour on the back of Mount Rakkas again. This is where we keep returning. The evening sun shines through the water mist at the fall up by Rakkasjokken. This is the point when Ulrika coins the expression that you never get used to the scenery up here. She is so right in that. We pedal the trails for a couple of hours before heading back to the now upgraded accommodation. Our last night will be spent in the so-called Solhyllan. The chalets are new, more luxurious, just below the hotel. The second lasagne for the weekend is sent into the oven while the sauna and jacuzzi are heating. They will deal with our aching leg muscles. We eat and drink, while discussing how to develop bicycling here. The potential is immense and communications are fine. The evening sun shines through the water mist at the fall up by Rakkasjokken. 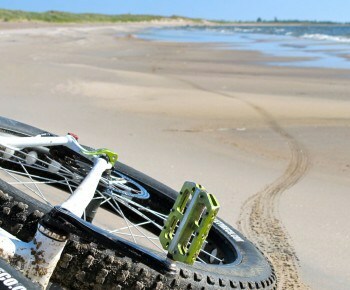 I am certain that Björkliden will be discovered by many more bikers?in this country and from abroad. Here is something for everyone; novices as well as veterans, young and more mature alike; irrespective of opting for downhill runs or cross-country tours. We have now come to the end of our magical weekend. We empty the chalet and pack the car. But still, we cannot miss a small morning tour. Who knows how much more biking we will see this autumn? You must make hay while the sun shines. I am surprised at the strength remaining in my muscles despite the intensity of the weekend, but at last, we load the bikes onto the roof of the car and steer southwards. But we will probably come back here; autumn bicycling in Björkliden has just become a new tradition. The article is previously published in Lapland Resorts Magazine 2013/2014.